Dog Intolerant of Other Dogs: if location, location, location, is the key in buying your ultimate dream home, then socialization, socialization, socialization is the key in having a dog that gets along with other dogs. Ideally, socialization should start as soon as possible when the dog is still a puppy. It has been reported that puppies have a “grace period” of up to 12 weeks of age where they intensely require as much contact as possible with other people and other dogs. If this “grace period” passes with improper socialization, then the whole socialization process will turn out to be much more difficult and challenging. 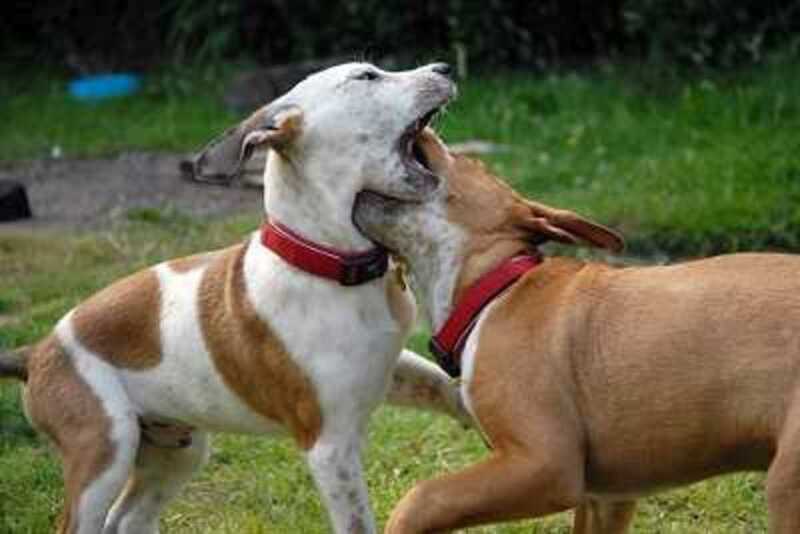 If your dog is unpleasant towards other dogs very likely he has not been properly socialized as a puppy. The truth comes up as the dog’s body stiffens in an aggressive posture and as he gives that typical gelid stare to another dog that crosses his path. The dog may as well growl and threaten to bite or he may simply bark with fear. A well socialized dog on the other hand instead will appear to be comfortable and even friendly when meeting other dogs during their walk. However, not everything is lost if your dog is intolerant and you are not necessarily obliged to permanently walk your dog only at night when no other dogs are around. While severe cases may need the intervention of a dog behaviorist, if your dog’s case is only mild there are some things you can try to do to turn him around. 1. First of all, if your dog is not altered yet consider getting him neutered. Neutering should make him less aggressive since all the hormones are out of the way. Neutering grants a better disposition, the dog may be less likely to get into competitive fights or roam away from home. 2. Invest in a good general lead collar. This collar looks more like a harness and helps you control the dog better since it wraps around the head. In case your dog would get over excited by the presence of other dogs with this leash you will be able to have him in much better control. 3. If the aggression or fear may very likely cause him to bite get a basket muzzle. These muzzles are of a large grid size so to allow the dog to pant, drink and even eat small treats or bits of food. Keep it on even if you are planning to keep your dog far from others dogs. You never know a dog may escape from its owner and get bit. The saying better safe than sorry is a very savvy one when it comes to preventing dog bites. 4. Now, take him to dog parks and start working on desensitization. Keep him at a safe distance form other dogs. Watch carefully for signs of fear or aggression. If he remains relaxed, then slowly get closer and praise him lavishly if he maintains that relaxed posture. Keep getting closer and closer to the other dogs over the course of the following weeks. 5. If you have a friend with another dog willing to help practice closer desensitization. Have you dog leashed and muzzled and ask the owner to slowly get the dog closer. Praise the dog’s relaxed state by giving a treat. Slowly the dog should be able to accept the other dog’s presence as it does not appear threatening anymore. This training method works because the dog gets to focus on the owner giving the treat rather than the dog getting closer. The dog as well will associate the dog getting closer with something pleasurable as a treat. These are 5 steps into getting a dog to tolerate better other dogs. If the above steps DO NOT work, a dog behaviorist should be contacted. If the above steps DO work then you can give yourself a good pat on the back for being able to successfully train your dog. Your dog has gone a long way into trusting you more and accepting dogs better, so make sure you do not forget to give your dog a good pat as well!